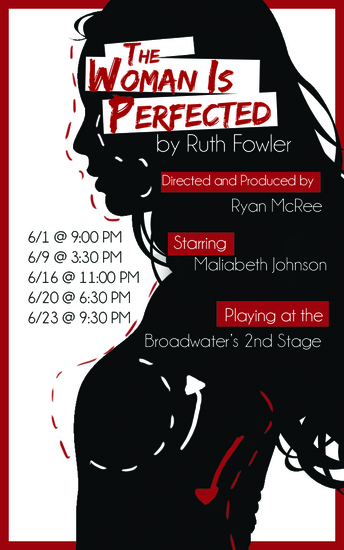 “The Woman Is Perfected” follows the psychological breakdown of a single young woman entangled in abusive relationships and a crippling compulsion to perfect her body through plastic surgery. Written by Ruth Fowler, starring Maliabeth Johnson (“Parks and Recreation,” “Mad Men,” “American Horror Story: Hotel”) and directed by Ryan McRee, this feminist “Everyman” tragedy will have its World Premiere at the Hollywood Fringe Festival. Ruth’s “sharp and unsparing” writing has been praised by numerous critics, and the recent premiere of her play “bled for the household truth” at Rogue Machine Theatre was labeled by the L.A. Times “a timely exposé of what passes for intimacy in the Digital Age.” Now, having shifted her focus to the commodification of women’s bodies, she presents a harrowing new psychodrama with her unique balance of clinical investigation and emotional exploration. The play challenges—in terms both literal and expressionistic—how to cling to a genuine sense of identity in a world in which appearances are dominant, artificiality is celebrated, and our customization options are very nearly infinite.